Reciprocity is the perfect topic to talk about this time of year. Today’s behavioral economics podcast is another foundations episode, and it’s all about reciprocity. 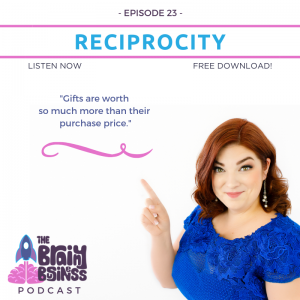 I explain how our brains process gift giving and why we often give reciprocal gifts of higher value than the original gift. I talk about how reciprocity can be used in your business and how it relates to generating leads. I also share insights into Sheldon’s theory of reciprocity on one of my favorite shows The Big Bang Theory. 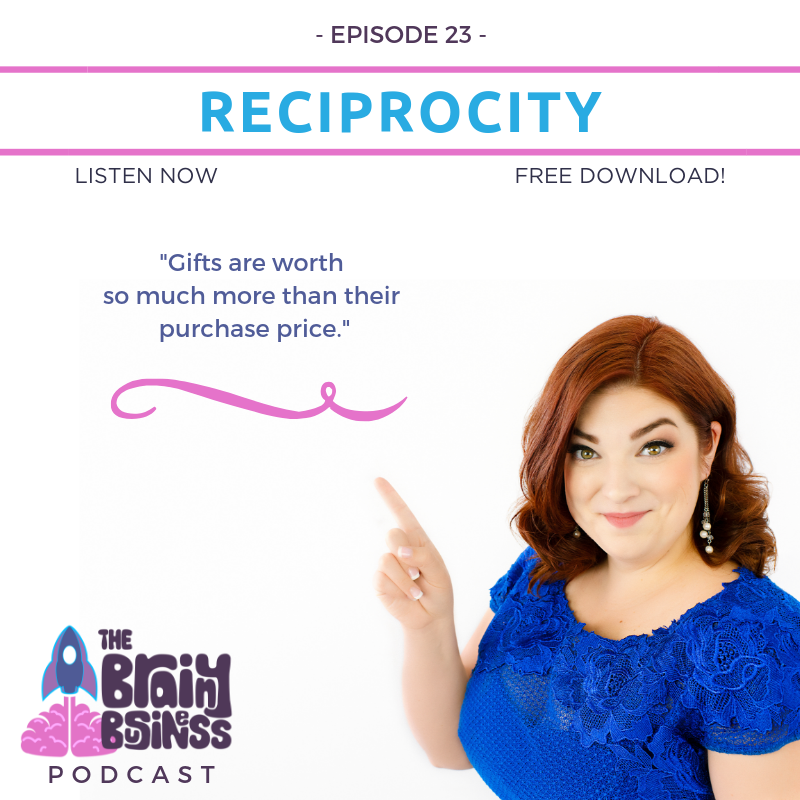 I talk about how our subconscious really feels about gift giving, three ways to use reciprocity in your business, and more. [10:07] Ways to use reciprocity in your business. [10:23] Reciprocity is what happens when someone gives you something (whether you wanted it or not, whether you really value it or not) and you feel obligated to give them something in return. [13:22] In reality, our brains overestimate the value of the gifts we’re given and overcompensate. [13:47] Tips go up when customers are given a mint with their check. The gift of kindness and a little effort goes a long way. [16:50] The subconscious feels obligated to pay back for gifts it receives and it often gives back more than it received. [17:10] Reciprocity presents itself in many ways. I’m going to talk about three main categories: the free gift, the small ask on the path to something bigger, and the big ask to get something more realistic. [17:22] The free gift is like mints or a lead magnet or the free content I put out on my blog and podcast. [19:15] The Brainy Business is about providing strategy to make messaging more effective and impactful. I’ve had many listeners reach out to me about partnering after listening to my show. If you’re interested, I’d love to hear from you too! [20:20] Free samples are also great for things that are a little obscure. Samples have another benefit of dopamine release with anticipation. [22:56] The free gift of a sample for something that people might be hesitant about trying (but you know is amazing) is a great double whammy of reciprocity and the dopamine release with anticipation. [23:06] Reciprocity and free gifts are often used when asking for donations. [25:35] Some other examples of “free gifts” are sales or discounts. Sales and discounts need to be offered strategically and not as a crutch. [28:02] I share a quick story of how giving out gum made my high school life a little bit easier. [29:46] My friend Nikki Rausch, Your Sales Maven, has written several books on relationship selling and she speaks on this around the country. One of her tips is to be of service to other people. [30:39] A small ask to get something bigger. Giving someone a button and a yard sign is more likely to influence them to vote for you then just asking for the vote. This is because of the escalation of commitment. [33:06] When asking for a donation cold turkey, there’s a good chance they will say no. Asking someone like a store owner to put a small sign in the window will actually influence them to donate to you. [34:34] This is because of the “foot-in-the-door” technique which creates a small shift in the way a person thinks. [35:26] This is also why loss-leaders work in business. [37:19] You start with a BIG (and somewhat ridiculous or unreasonable) ask to make the thing you actually want to ask for seem more reasonable and appealing. [39:27] An example of using a big ask to get volunteers on a college campus. [43:46] An example from money coach Mikelann Valterra on how to pick a “resentment number” when pricing client work or bidding projects. [46:44] I have always been one to reward people who ask for things (my own version of reciprocity). It takes a little something extra to step away from the norm and ask for something outside the status quo. [48:52] So here is a GIFT FOR YOU: Anyone who commits to six strategy sessions before the end of the year, instead of $499 a piece, they will be $450 – so you will save almost $300. And you get priority space on my calendar, which fills up pretty fast these days. [49:23] If you commit by the end of the year to 12 strategy sessions in 2019, I will do them for $400 apiece. That means you will save almost $1200! That is two free strategy sessions plus some gravy cash in your pocket. Interested? Let’s chat. Episode 3. Do Lead Magnets Work and Do You Need One?